On Monday, 7 th November berryBI team was hosting the Customer Event. Despite the nasty and cold weather outside the atmosphere of the event was warm and friendly. The main ‘fuel’ for mind was provided by historian David Vseviov who was talking about data and knowledge. In his natural manner David enchanted listeners by his own stories. By means of simple real life examples historian explained how knowledge is being born from data. Data without analysis is just the list of numbers and letters. But once it has been organized, sorted and analyzed it becomes the precious knowledge. And already using this knowledge important decisions can be made. After philosophical conversation with David Vseviov guests were enjoying the action film ‘The Accountant’. The exciting plot of this movie was spiced up by data analysis and data mining riddles. But of course, the main purpose of this event was to introduce berryBI team’s services. Possessing practical 15 years’ experience in data warehousing ‘berries’ can offer a wide spectrum of services and cover the missing resources of the company. The team has expertise in different industries such as Banking & Finance, Public Sector & Education, Logistics & Transportation. BerryBI can offer entire and complete solutions such Business analysis, Data warehouse & Quality, Data visualisation & BI, Data-driven consultancy and many more. 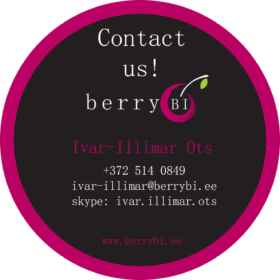 So, if you need a reliable and trustworthy partner to assist with BI & DWH projects or cover Business Intelligence & Data Warehousing resources berryBI team is what you need!